“Add little to little, and there will be a big pile,” said Ovid, ancient Roman poet and creator of Metamorphoses. It’s incredible — not only how simple ideas like this withstand the test of time — but more so that we still haven’t learned from these ancient lessons. This idea of “adding little to little,” while rather matter-of-fact when taken literally, becomes an almost harsh, startling, and sarcastic metaphor when taken more generally, referring to the mere idea that sometimes less is more, and that adding complexity to something doesn’t necessarily mean it’s going to be better. Fast forward over 2,000 years to present time, when we find ourselves in an era of technology, constant adaptation, and enormous systems built on the power of iteration. Ironically enough, one of the biggest systems today — the education system — is subject to this startling lesson, quite possibly more so than any other system. For in education, we seem to continuously be adding little to little, and we’ve ended up with a big pile… of something. This phenomenon, where we add little to little and end up with a whole big pile of nothing, is better known as the second system effect. And here’s how it works: You have a great idea, and you begin to develop it. You invest your money, your time, and not to mention, your heart and soul into your new idea. With some luck, it catches on, and suddenly, something that was just a figment of your imagination is now reality. Such is the case with any great idea: throughout the first stage of idea development, you notice shortcomings and areas for improvement. In many cases, these improvements end up manifesting themselves as embellishments, despite the fact that they are supposed to make the original idea better. More often than not, however, these embellishments do little improving and only add to the complexity of the original idea. Suddenly, what was your original idea, your original product, or the simple system you originally imagined becomes overgrown and no longer manageable. The complexity of the system becomes unsustainable, its new embellishments becoming too much for the shaky foundation to hold. In the mid 1980s, America realized we had a problem: we were no longer living up to our international counterparts educationally, and something had to be done about it. 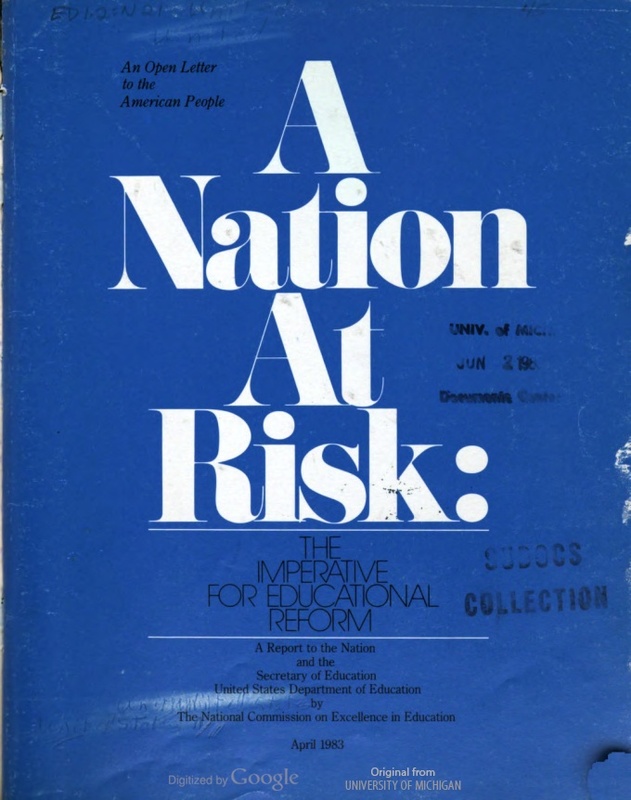 The Reagan Administration published “A Nation at Risk,” fear swept the country, and as good fearful citizens do, we let the fear consume us. While I’m sure some thoughtful reflection came out of our sub-par test scores, thirty years later, it seems that maybe — just maybe — we got it all wrong. The resulting decades have saturated us with standardized testing, rigid accountability measures, and small tweaks and amendments to an already broken set of policies, leaving us to wonder, how will yet another reauthorization of an already ineffective policy really do us any good? Or are these changes to the ESEA merely an empty attempt to build upon something that already is far past broken? Better yet, is this just another “second” or maybe even a “third” system, doomed to fail, no matter what we do? In my opinion, the solution isn’t amendment; it might not even be innovation. Instead, we need to reinvent — to rebuild from the ground up. Sure, it’s easy for me to sit here, sipping my coffee, pontificating over the problems with our current education system. And what do I suggest we do about it, you ask? Well, I never thought I’d say this, but privatizing education might be the only way. I’m not necessarily saying it has to be this way forever, but maybe — just maybe — a “micro” boost from the private sector could help us out. And before you judge, oh, fellow public school teacher, just hear me out… just for a second. Right now, the education system is absolutely enormous. And, like any big system, when something becomes so unwieldy, systems have no choice but to place objective accountability measures on teachers, students, and administrators. These objective measures remove the humanism that permeates our jobs; it creates a drought of personal connection and student-centered learning, all in an effort to live up to these unrealistic standards. As a result, we have succumbed to one view of the education system, and this view is at the macro-level. We see students and staff as simply cogs in the wheel, helping us to work towards some abstract sort of goal — to beat out those other countries on their three-digit test score. But teaching, learning, and growing happen on a micro-level, before they even have the potential to make it to the macro-level. wants and needs from a few on high; instead, our central headquarters is there to assist me with user research, data collection, and organization, so that I may respond to data, make decisions, and ultimately better the learning environment I’ve created through collaborative decision-making. Truth be told, this will never happen in the public sector — at least not any time soon. And this is because the private sector has advantages that the public sector doesn’t. Public education has become so overgrown and bureaucratic that so many have lost themselves in the system. I know I almost did. They’ve lost sight of what we’re actually trying to do in our classrooms: to nurture, to inspire, and to help kids find themselves in the context of a big, big world. We can’t do that with a macro-level view, and we will never achieve that with top-down directives coming from those so far removed from the classroom. From the top down, children and teachers simply look like dots on a map; however, from the bottom up, those tiny dots can look up and see a broad and expansive sky, reminiscent of all the possibilities that come from a student-centered, teacher-led, and user-driven classroom. Of course, we want education for all, and permanently privatizing education isn’t going to get us there. But the public education system, as it stands, is riddled with inequity, robbing many of the opportunities that it promises. It needs a major overhaul, and we won’t be able to manifest this ideal of education for all until we’ve rebuilt the current system from scratch. Perhaps temporary privatization, led by the micro-school movement, is all the push we need to restructure the public sector and get it back on its feet. We all need a mentor, we all need to start small, and we all need someone crazy enough to try something new, absorb the collateral damage, and pave the way for a new way of thinking. In my humble opinion, the micro-school movement is all the small, crazy mentor we need. Let’s just give it a little time. I worry about privatization and access…if schools end up privatized, will there be further barriers preventing kids from accessing quality teaching and learning? In a privatized system, why would a school want to accept kids who struggle, if the system is not compelled to? Nonetheless, I agree that the system (as is) is too cumbersome, top-heavy, and in dire need of an overhaul. I wonder if the overhaul might not necessarily be pure privatization, but greater local flexibility and control…which could include a degree of private support and sponsorship at a local level, while still relying upon taxpayer support to provide for access to all kids. Ultimately, decision-making power needs to be closer to the classroom, not closer to the capitol. Granted, more local control still will no necessarily ensure equal access, since resources are unevenly distributed. What I do believe, whether it is privatization or greater local autonomy and control (less government meddling and blanket policymaking) the solution will be small-scale, not large scale, like you talk about. Hey Mark, I think that’s one of the most difficult things for me, as a teacher in a private school — equal access for all. I’m lucky enough that our school has a philanthropic department that provides scholarships, but I agree that, long-term and large-scale, that may not be enough to help all children reach their full potential. I suppose I should have been more clear with my message, in the sense that perhaps temporary privatization of schools could be a potential solution. If a private organization could scale a high-quality system for educating all children, then it could help inform a new model for public school systems. In my opinion, the micro-school system could be a way to go, but this will not currently fly in public schools, as it will take a huge restructuring. In a micro-school system, you get the benefits of both a large and small system, in the sense that micro-schools or individual sites have full autonomy to respond to student/parent needs, while the central office is able to help with organization, data collection, etc. It’s similar, in a way, to how a school district may operate, but different due to the responsibilities the central office holds and the size of each individual school, making it more manageable for individual sites. In the micro-school model, the schools hold the power for decision-making, and the central office serves as the source for support and systematizing/scaling processes that teachers and site-level admins shouldn’t have to deal with. Would love to talk more about this.